BOSTON (September 28, 2017) - WinnCompanies, an award-winning multifamily development and management company, today announced the completion of $24.2 million in construction to transform a 112-year-old yarn mill in Fitchburg, MA, into 96 units of true mixed-income housing. Massachusetts Lt. Gov. Karyn Polito, Secretary of Housing and Economic Development Jay Ash and Fitchburg Mayor Stephen L. DiNatale were among the dignitaries to attend the ribbon-cutting ceremony for Yarn Works Apartments, a three-story 190,000-square-foot brick mill building on 7.4 acres along the Nashua River in Fitchburg, MA. Yarn Works is a once-proud historic property now reborn as a modern community asset that not only provides badly needed housing but also direct and indirect economic impacts for the local community, said Larry Curtis, president and managing partner of WinnDevelopment. We're pleased to have been part of this public-private effort to support new housing and economic growth for the City of Fitchburg. The City has a been a great partner in this effort. This celebration is years in the making, and I want to congratulate Fitchburg and WinnDevelopment on your efforts and collaboration with our MassWorks infrastructure and MassHousing investments, said Lt. Governor Polito. 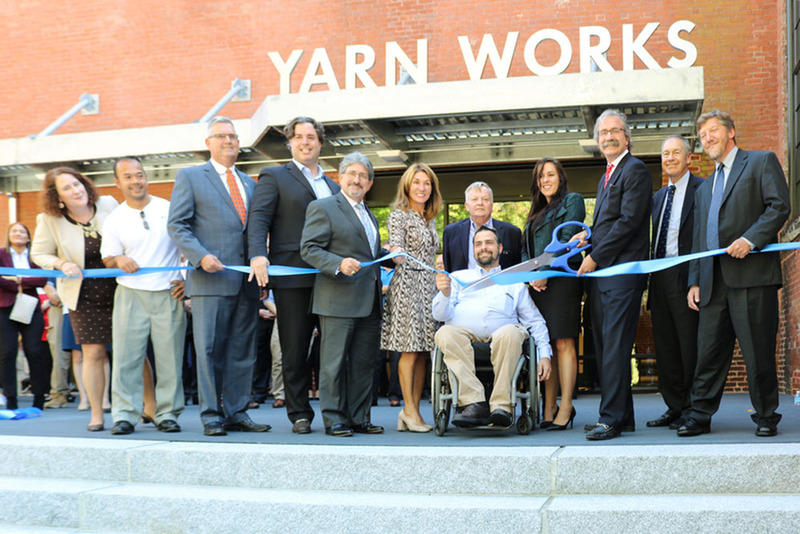 Yarn Works is a smart development, capitalizing on the need for downtown revitalization and affordable housing near transit and educational opportunities in Fitchburg. Located less than one mile from the city's commuter rail station and from Fitchburg State College, Yarn Works Apartments represents a true mixed-income community with current tenancy of 30 percent market renters; 30 percent middle income/workforce earners; and 40 percent of the units set aside for residents earning 60 percent or below of the Area Median Income (AMI). We are leasing units at a better-than-expected pace and Yarn Works is setting the market in terms of rent. said WinnDevelopment Senior Vice President Adam Stein. Residents are excited about the innovative approach to unit layouts, amenity spaces and the unique features only offered in a historic mill conversion. We've become the best product on the market. Public financing partners included the Massachusetts Executive Office of Housing & Community Development, MassHousing, and the City of Fitchburg. Boston Financial Investment Management, Bank of America, Boston Community Loan Fund, and the Massachusetts Housing Partnership acted as private financing partners. Numerous financial resources were combined to support the project: Federal and state Low Income Housing Tax Credits from the Baker-Polito administration; federal and state Historic Tax Credits from the National Park Service and Massachusetts Historical Commission; as well as support from the Affordable Housing Trust, Housing Stabilization Funds, HOME funds, Community-Based Housing, Facilities Consolidation Funds, and City of Fitchburg HOME funds. In addition, the City of Fitchburg received a $3 million MassWorks award from the Commonwealth to improve infrastructure near Yarn Works, with a special focus on the reconstruction of Main and River streets. Yarn Works is meeting an important need for high-quality apartment living in downtown Fitchburg, said Mayor DiNatale. There is a reason these units leased up so quickly: It speaks to a growing demand for this style of living, and to a rapidly improving housing market in the city. WinnCompanies has been a great partner in this project, and we hope to see many such projects in the future. The Yarn Works Apartments typifies the kind of quality mixed-income, transit-oriented housing that is badly needed throughout the Commonwealth,'' said MassHousing Executive Director Tim Sullivan. We were pleased to collaborate with WinnCompanies, the Baker-Polito Administration, and the city of Fitchburg to help transform an underutilized mill property into 96 new apartments in downtown Fitchburg that are now home to residents with a range of incomes who want to live and work in the city. WinnCompanies has an exceptional record of transforming formerly blighted mill properties into new, vibrant housing communities and the Yarn Works Apartments will help revitalize downtown Fitchburg and serve as an important housing resource for many years to come. Congratulations to the City of Fitchburg and WinnCompanies for working to turn this historic mill into mixed-income housing that's near downtown and the commuter rail, said Clark Ziegler, executive director of the Massachusetts Housing Partnership. The city deserves credit not just for its financial support but also for creating a mill overlay district that paves the way for this type of development. WinnCompanies should be saluted for their ability to turn abandoned mills into attractive homes that will serve working people and families for years to come. Winn has the extraordinary ability to make the complicated, challenging work of mill redevelopment look simple. To date, WinnDevelopment has completed 36 adaptive reuse projects in five states and the District of Columbia, transforming historic properties into more than 3,600 units of mixed-income housing with a collective assessed value of more than $500 million. Yarn Works is managed by WinnResidential, the property management arm of WinnCompanies, which currently manages Fitchburg Place, as 96-unit community on Pritchard Street in Fitchburg for residents aged 62 or older. The Architectural Team, of Chelsea, MA. served as architect on the project and Colantonio, Inc., of Holliston, MA, as the general contractor. The original mill building was constructed in just five months around the start of the 20th century, according to historical reports. It was the home of the Fitchburg Yarn Company, creating cotton yarns as one of 16 textile manufacturers in the city. All told, Fitchburg makes eight miles of cotton yarn a minute and a mile of cloth every eight minutes, according to a February 1909 article in the monthly New England Magazine. During the 1960s, the company claimed in advertisements that the mill was the first in the world to produce spun rayon. Pictured, Left to Right: Karen Kelleher, Deputy Director of MassHousing, Dean Tran Councilor-At-Large for Fitchburg, Stephan Hay, State Representative, Gilbert Winn, CEO of WinnCompanies, Stephen DiNatale, Mayor of Fitchburg, Karyn Polito, Lt. Governor of Commonwealth, Robert Verrier, President of The Architectural Team, Scott Maenpaa, Project Director for The Architectural Team, LeAnn Hanfield, Senior Project Director for WinnDevelopment, Larry Curtis, President of WinnDevelopment, Michael Putziger, Chairman of WinnCompanies and Clark Ziegler, Executive Director of Massachusetts Housing Partnership.